I got quite a lot of questions on my yesterday’s email on ideas to trade. Hope you are doing good. I learned a lot through your conservative attitude & greed control articles. Thanks for your awesome conservative strategies. I have one silly question to ask that in this article you recommended ICICI Nifty Index Mutual Fund. When I see the top portfolio of such front line index funds I see that almost all mutual funds have mostly similar blue chips in their top holdings. My question is what difference it takes if we directly invest in such blue chips which are already 40 to 50% down from their 52 week high instead of investing in same sticks via mutual fund which charge us yearly expense ratio. Can you please share pros & cons between investing into index mutual funds than directly investing into stocks? Thanks for your valuable guidance as always. When you invest in Nifty Index Fund for a short term, then you are rest assured that if Nifty rises then the Index Fund or Nifty Bees will also rise in value and you will surly make a profit. It is but commonsense that one day or the other (and that day is not far) when Nifty will be around 8000 – which is almost 12-13% from current levels. In that case your investment in Nifty Index Fund or Nifty Bees will give a guaranteed return of 11-12% (1% deducted for expenses) in few days or months. On top of that you don’t have to do research for Stocks that may rise. You just cannot invest in ALL the basket of stocks that these mutual funds invest in. Tracking them is very difficult too. So you will chose 3 or 4. This will take time. And the worst part is there is no guarantee these stocks will beat returns of Nifty in a short period. So when you invest in an Index mutual fund, your time is saved and your investment is also diversified. You can live in peace, and you can invest as much as you can, the money that you don’t need for 1 year. Remember that this particular investment is for 1 year and our target is to make 12-15% return in one year. With investing in a stock it gets risky. You may choose a correct stock and make a stellar return from that stock, but there is a high chance that your chosen stock does not perform. Or if you are invested in 4-5 different stocks then one bad investment can pull down return from the entire portfolio. In the end your profit may be less than an Index fund even after deducting 1% of the expenses. 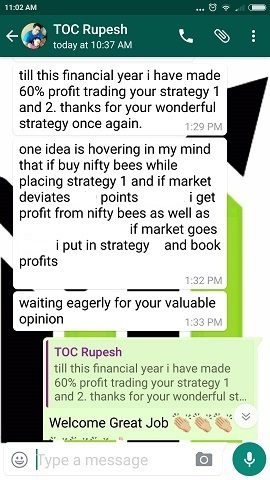 So if its for short to medium term I would rather invest in an Index fund or Nifty BeEs rather than a few stocks, to feel safe. I am ok with a lower return but with a very high chance of success. You Mean To Say We Must NEVER Invest In Stocks? I never said that. Nifty is currently 20% lower than its recent high about an year ago. Nifty for sure will try to reach its mean within months. Let us not get into math, but 8000 looks certain in few months. We are talking about making more or less 10-12% in 6-12 months. At present investing in an Index fund looks the safest option to me. That is it. Yes in a few months from now some good stocks will double and you will rant on me for giving a bad advice. But do you know the name of that stock today? NO. If you don’t know then it is always better to sacrifice some greed to make more or less what we want to make. How many people you know have stuck in a bad stock for years? Many. How many people do you know are stuck in Index Funds or Nifty Bees for years? None. Note: Some greedy trader out there might be thinking I am a fool. Why am I not investing in Nifty Future when I know Nifty will be at 8000 some day. Thank You Sir. Every investment has an objective and this one is to make 12% in 6-12 months only with low risk. For investing in Nifty Futures I have different cash, a bit lower amount though, through which I can take aggressive bets. But not buying a Future now and selling it when Nifty reaches 8000. That’s a foolish trade in my books. So When Should You Invest In Stocks? Yes you must have a portfolio of good stocks. It could be anywhere from 10 to 15 stocks max. And you should every month invest in them in equal amounts for ALL your earning life, which is 30-35 years. 80% of them will prove to be losers, after 30 years of investment. But 20% of them will be worth crores. I mean multi-crores. The dividends itself will far surpass the invested amount. Just this small investment every month can take care of your retirement years. Read this article on how to make crores from the stock markets. Note that this is one part of diversification – a very small part indeed. Some money should get into trading for regular income. Some money in liquid funds or fixed deposits that you may need urgently. What I am trying to say is that if you can save 100 rupees a month you should know what percentage of it to invest where. And you should stick to the rule – no matter how good you are doing with your trading. Even after making good profits since last few years in trading I am not going to invest ALL my investments in trading. I believe in diversification and this is how I do it. Diversifying your money is very important when its matter of investments. You must know how much you need in few months, years and decades from now. Ok you may not be perfect but you must have an idea. Its always better to invest and work towards achieving those goals in time or slightly before that time. Over all 20% return a year from all of your investment will be huge. Frankly if you don’t need that money now – its really a useless exercise to try to make that RIGHT NOW. That’s the reason I believe in making small profits on a consistent basis, rather try to make a lot in couple of months. 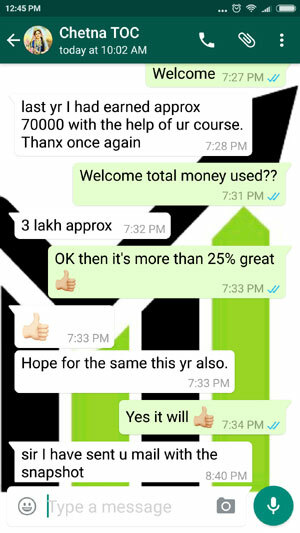 That’s the exact reason I do not promise anyone more than 3% per month from the strategies in my course. Its a different matter that some of my customers are making more than that, but I really don’t care. These small steps will become BIG STEPS in matter of years. And it is possible for every trader. Unfortunately this website will keep getting traffic for making 5000 per day from stock markets, or 1 lakh per month. Some even search for 50 crore a year – lol. Well nothing wrong in having such targets after all we trade to make money – but the problem lies somewhere else. The problem is when I get calls from such people, all they have is paltry 25000 in their account. These people are the targets of the tips providers. In a couple of month their account shows ZERO rupees. Hope you are not one of them. You know what – it does not matter if you have patience or not. If you survive then you will turn 60 anyway – you can’t stop the aging process, can you? And if you don’t, then even all the money in the world if given to you is worthless. Hope you get the point. This attitude of “I need more and I need it now” is a sure shot way of destroying your wealth. So learn to be happy with small profits. Occasionally if big profits do come be happy – but don’t lose it again to make big profits. Smart trading and patience is the key in making money in stock markets. When I didn’t have patience I lost a lot. When I started being happy even with 1% return a month, I started making good money. If you don’t know 1% return a month is NOT 12% return a year – its 15% return a year compounded. For most of us even 15% a year is a great return. I genuinely believe its a real good write-up with the links to support it. There’s a multitude out there still groping with little or no knowledge about investments or trading, and yet venturing out to boldly make some ‘easy money’. Life is tough out there. Perhaps its not their fault – we were once like that too – I believe – not so long ago – but wiser after all the setbacks and failures. Whatever, I think people should invest in knowledge, if not at least learn from their costly mistakes, and not keep repeating the same mistakes again. It reminds me of a quote: “Learn from your losses. They are expensive lessons. You paid for them”. Whatever is written here may please not be made public. (At least not with my name) It was written in confidence only for your reading after seeing so many of my friends continuing to remain the same despite their setbacks. Some don’t want to learn, I suppose. Some want to learn but don’t want to spend, and some just want it all ready-made. Well the world has all types. Please note that the person who wrote the above email is my paid customer of my course. Did you notice the change in his attitude towards the stock markets? He is now very happy with the small profits he makes every month. The course will not only teach you five conservative strategies, but will also change your view towards the markets. In other words, it will help you control greed which is one of the biggest enemy of the stock markets. His last sentence is very correct. “Some want to learn but don’t want to spend, and some just want it all ready-made.” More than 99% of people who visit this blog do not pay for the course. I think the biggest reason is they don’t want to spend money to learn something that can make them 3% a month. For most its too less. Its strange that they keep losing money month after month, but are still looking for strategies that can double their money in few months. Let me tell you such strategies do not exist. You will keep looking for it for years and still will not find it. And mind it, 3% a month is not a low return, compounded this can be great return in years to come. 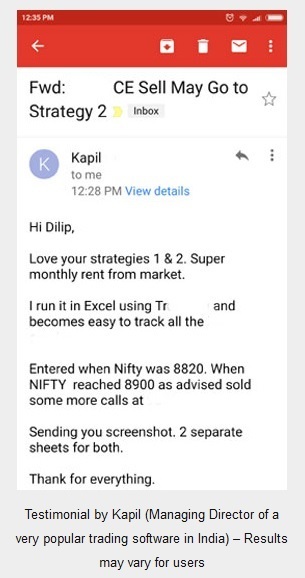 I have lost almost 6-7 lakhs in just last 6-7 years and still in this market. (Don’t know why …. It’s really pain to me, Whatever i have lost is my hard money and not lottery money. I am working in a company getting salary every month. Is it possible to get that LOST money back ? can i change my mindset …let me tell you one thing , I have tried it many times, every time when i lost my money, I told myself not to do this again and still it never worked. There are two minds – one is full of EGO and another is clear mind. each and every time EGO one takes control over another one and finally …. So, it’s like everything is written in Bhagwatgeeta what and how to live your life but no one follows only saints know how to follow …Here also we know what to do and what not to do …but MONEY is a major evil …if it’s LAXMI we respect her but when it’s money, we destroy it …. My genuine question is can i surrender now ? or can i continue ? This attitude of â€œI need more and I need it nowâ€ is a sure shot way of destroying your wealth. – you said it. But – if you want to start again you need to have a very different mindset like “I will be satisfied even if I make 1.5% a month”. And you cannot “recover” what is lost, you can only make profits in future. If age is on your side and you can invest at least 80,000 now and if possible a few thousands more every year, then you should do the course. My age is 39 at present. Wife and two kids dependent on me. So do you still say, age is on my side ? As you said this is the story of almost everyone means 95% people in the stock market, but i don’t want to be everyone. EVERYONE losses money EVERY TIME. I just searching a confidence from the people who are there in the market since long and still not loosing money as well as MIND. Please do not be so negative. Think about making crores but in 20-30 years time. 1 lakh every year for next 25 should do that. 39 is good to start I still see 21 years of active life. Go ahead and do the course. I am an email subscriber and I have not taken your course. But your advise to control greed and how to diversify is just awesome. You sound a real person in your words. I hope GOD gives you lots of happiness (and people should understand it is not money that makes a person happy). When you make money in the markets you get a kick, its like drugs which give you temporary kick for 2-3 minutes, or if the drug is dangerous it can give you 2-3 hours also. But quick money in the stock markets is like that dangerous drug, which no doubt gives you that kick but remember that drug poisons your lungs, or it could damage your lever forever. So everyone should understand Dilip’s mail carefully. Don’t go for temporary pleasures and go for small returns and over long time, that’s the power of compounding, which will keep you happy forever and most importantly stress free ;-). All the best Dilip and to your strategies. Thanks for sharing and repeating “Common yet Uncommon” knowledge through your mail and post. I don’t remember how I got the link of yours newsletter.. But seriously you are fantastic.. Your way of thinking…awesome. aspects of investing, trading, savings, fear, greed, diversification etc etc. I have forwarded the same to my friends. The spell checker in me is back. Hope not irritating you with my spell checking business. 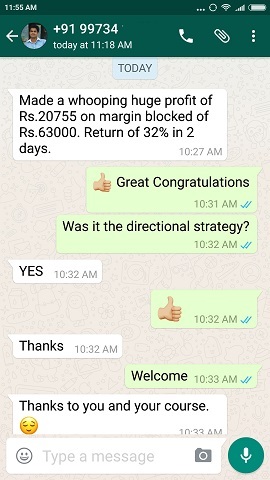 In the case of omkar I would like to say that if he is making atleast 50,000/- p.m. as his primary income then only he should continue with trading and that also after learning some charting and technical analysis. I know the pain of loss. I am 27 and lost more than 10 lacs in last year. The experience was killing. But after that I learned some strategies, some principles and now I have again started with trading. This is an attempt. Hopes are 85% of winning but if not it will be a goodbye to trading. There are so many businesses out there to make money and live a peaceful life. As you said and it is very true, a loss can not be recovered. Your are good, not just good but the best. Showing people the right way is not the business, it’s a good work and you are doing it. I truely appreciate. >> I am 27 and lost more than 10 lacs in last year. I hope you are not trading aggressively, because trading to recover losses can lead to more losses. There is nothing as bad as “Revenge Trading”. Nobody till date has succeeded doing revenge trading in stock markets.